(L-R) Elizabeth Warren, Nancy Pelosi, Chuck Schumer//Berryville, VA. July 25th, 2017. Hillary Clinton's loss left the Democratic party despised on both sides of the aisle. After 6 months of making a spectacle of the “Russia scandal”, Democratic leaders have announced a program that would allegedly prioritize working class Americans in an effort to re-establish the party as one that supports the “little guy”. On Monday, Senate Minority Leader Chuck Schumer led the announcement of a new economic program unironically called the “Better Deal”. Under the plan, Democrats seek to increase quality of life for Americans by increasing the minimum wage to $15, tackling rising healthcare costs, and limiting the power of corporate interests in politics. During the announcement in Berryville, Virginia, House Minority Leader Nancy Pelosi hammered away at the idea of reclaiming the trust of working class Americans, a sentiment echoed by a cabal of notable Democrats standing behind her. 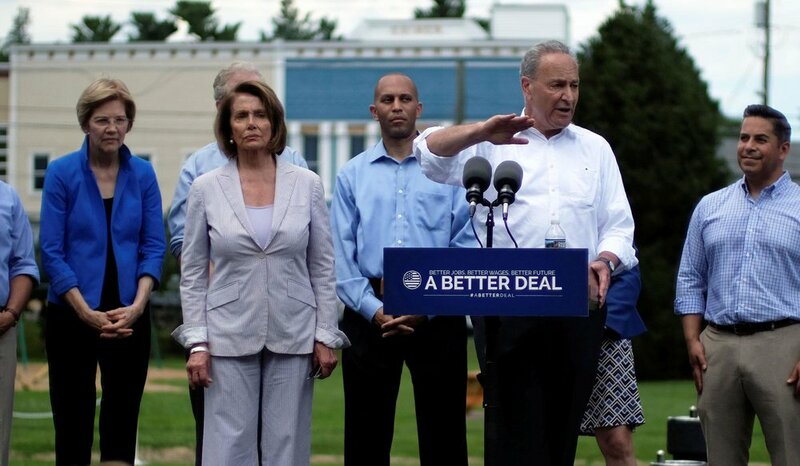 The “Better Deal” itself isn’t complete and Democratic leaders have acknowledged the challenges of attempting cooperation with a Republican led congress on a plan which emphasizes regulation and public spending. This effort seemingly targets the working class voter base which swayed in support of Trump during the election, and the left-leaning Bernie Sanders advocates in an attempt to reclaim Democratic voters. Schumer admitted the failings of the Democratic party, stating “the American people don’t know what we stand for anymore”. He continued on to take responsibility for Hillary Clinton’s loss and the “at least I’m not the other guy” attitude Clinton’s campaign adopted. This notion directly contradicts Clinton’s explanation for her defeat in which she concludes the publicized FBI investigation into her e-mail scandal, Russia, and Wikileaks “scared” her voters away. The announcement of the “Better Deal” presents itself as a way for the Democratic party to make a turnaround after their defeat in 2016, but could be justifiably perceived as a last-ditch effort to reclaim trust in a distinct group of voters--one which Democrats wrongly believed belonged to them. Schumer and Pelosi listed actions to be taken under the plan, ranging from increasing social spending in paid leave to regulating industries that hold a monopoly on consumer goods. Schumer conspicuously called out “old fashion capitalists” for posing detriment to the workforce, and proposed the idea of breaking up companies too big to fairly compete with other businesses. While the Better Deal is delivered as an answer to age-old economic challenges faced by majority of Americans, primary concerns immediately arise when analyzing the Democrats’ tendency of applying band-aid solutions to long standing, conflicted platform points. One chronic weakness is the desire to “tame” capitalism with small-scale, superficially socialist tactics. Schumer, like many establishment Democrats, only merely mentions the problem of job loss and price increases while failing to address the reason why companies take advantage in the lack of regulatory practice. Corporations prioritize their bottom line in a free market system before anything else, and these failings can only be attributed to their enablement by both Republicans and Democrats. Corporations know it costs less to use low wage employment in countries with less regulations and the substantially smaller risk involved with machine manufacturing in lieu of human workers. No amount of tax breaks or penalties can alleviate the damage caused by what many people refuse to acknowledge simply as corporate greed--a natural component of the capitalist culture which thrives in the United States. No amount of promises from either side of the political aisle can bring back the amount of lost jobs, and this directly affects the populace Democrats are attempting to sway. In the announcement, the Democratic leaders made a point to reinforce being the workers’ party, as they were several decades ago. Schumer himself admitted to a divide in the working class, referring to a political rift between the “diverse Obama coalition and the blue collar workers from America’s heartland”, emphasizing the party’s vision of uniting the minority and white working classes. However, those words ring hollow to many, especially marginalized voters attacked by Trump’s campaign rhetoric and simultaneously forgotten by the party who claims to support them. Trump’s success is easily linked to fear-mongering and hateful vitriol against racial minorities, and the Democrats' flaccid approach to squelching such behaviour has not gone unnoticed. Specifically relevant are Trump's repeated calls to deport 11 million immigrants, of which the majority are Mexican. Trump’s base, the aforementioned white working class, overwhelmingly blames the loss of jobs in the United States either to Mexican-American immigrants or Mexican workers taking their jobs for lower wages south of the border. While a lot of the rhetoric is anecdotal, it hardly proves the relationship between loss of jobs and “illegal” immigration from Mexico. Muslims were also a target; instead of economic turmoil, Trump hinged national security exclusively on travel and immigration from Muslim majority countries, which led directly to the institutionalization of travel bans since his inauguration. However superficial, Trump’s demagoguery was enough to fuel the voter block to turn up at the polls. And thus, another chronic weakness presents itself: without analyzing the details, it is obvious why a prospective Democratic base would not want to "unite" with those who voted for Trump, and why liberal (and left-leaning) voters may not agree that cooperation is the absolute answer. Democrats have continuously failed to recognize the ideological disparities that motivate each base; whereas one is propelled by racism, xenophobia and remnants of a white America, the other seeks some kind of inclusivity and new-age nationalism. How exactly could Democrats overcome such differences in morals and practice? In typical Democrat fashion, Schumer makes no mention of this hateful motivator, nor does he condemn its use. Until the Democratic leadership can come to terms with the ugly reality separating working class voters, the unity they preach will remain nothing more than an empty promise. While Democrats attempt to unite Trump’s base with one they’ve barely secured for themselves, America’s most Democrat-leaning voters remain continuously overlooked. Black Americans championed the largest voter turnout in U.S. history for Barack Obama, both in 2008 and 2012. It’s impossible to envision Hillary Clinton ever stimulating the same results, but it stands to reason the Democratic party could have done a better job in addressing the concerns of Black Americans. The blame for the Democrats’ loss belongs solely to HRC and Democrats who enabled her poorly focused campaign. 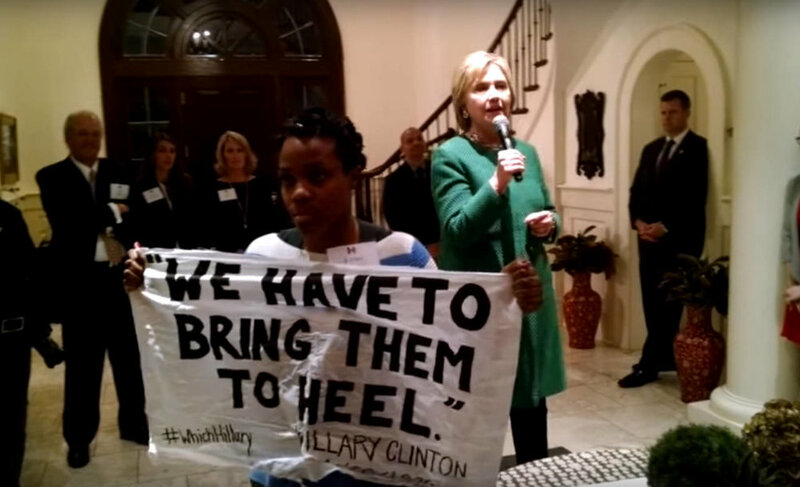 Clinton ran her presidential bid by believing she was entitled to votes of Black and working class voters without actually addressing their fears and conflicts. Voters harmed by Democratic policies and decisions are justified in their trepidation regarding the Better Deal. No amount of Russian hacking contributed to Clinton's defeat as much as her “super predator” comments or the support she gave to her husband’s crime bill in the 90’s. Clinton and the Democrats additionally failed young Black voters by offering a war hawk candidate who was weak on law enforcement regulation and one with an extensive history of military involvement abroad; two issues which young Black voters are provenly passionate about. Instead of fighting police brutality and protecting Black Americans, the Democrats promoted their detriment. In place of safeguarding living wages and advocating for an immediate increase in minimum pay, the party leader teetered between safe, middle-ground politics to appease her financiers. Discussion of Russian interference in the general election should never be considered a realistic cause for Clinton's failures when the Democrats repeatedly and remorselessly abandoned those who needed them most. For inquiries regarding this article, contact Jibril Ali @jibrilalpha.